I love discovering new brands and I love brands who have a story to tell. 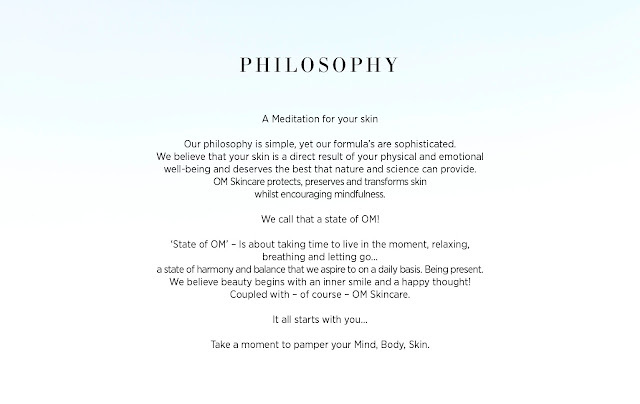 Om Skincare ticks both of those boxes. Dr Om, founder of OM Skincare has combined her scientific hertiage with her love of ancient wisdom along with the transforming properties of nature to create a brand which is simply amazing (so much so it is stocked in SpaceNK). With her flawles skin and incredible succesess in her field, I was lucky enough to meet Dr OM and learn about the range. Pure Glow Cleanser, a gentle and deeply nourishing cleanser that’s also as a make up remover and deep cleansing treatment. No Lines Nourishing Treatment (pictured at the top for review in a future post) repairs and rejuvenates the skin minimising fine lines. Invisible Finish Primer has SPF40 and UVA and UVB protection that brightens and moisturises for a luminous complexion. Miracle Serum is for an instant boost for radiant and glowing skin. The final item which I have been using is the Daily Radiance Moisturiser gives the skin a luminous glow and provide deep hydration. This is a cream which is perfect for all skin types, can be used for your daytime or nighttime cream and it is just divine. It is richly luxurious and feels incredible on the skin, mine drinking it up as quick as I can apply it. Ingredients such as Larch Tree Extract, Cucumis Sativus (Cucumber) Fruit Extract and Tetrapeptide-9 which is known as the Expert High Tech Youth Cure, stimulates collagen production and provides a firming, anti-aging effect on the skin, make for an incredibly hydrating cream and one which stimulates collagen production and improves support tissues which help to maintain firm, glowing and youthful skin. If you need a new moisturising and hydrating cream, then this is one I would highly recommend! I in general very brand loyal with skin care, but this sounds deliciously good. One to try out. I've not heard of this brand but this sounds like just the sort cream tgstcwould be ideal for me! They sound like great products, I especially like the sound of the invisible finish primer as a product with a high SPF like that is really worth having. It sounds good, I love a really nourishing face cream that really feels like a treat for the skin. We have a SpaceNK in our town, maybe I should pop in and try this range out! The packaging of these looks lovely and it sounds like you liked the cream.